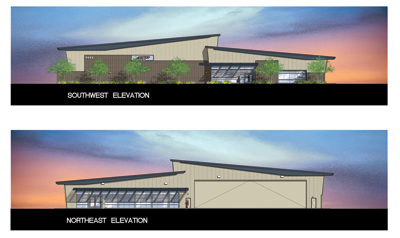 ATP is excited to announce it has begun construction of a new facility at Phoenix-Mesa Gateway Airport (IWA). This new location is sure to be a premier destination for Airline Career Pilot program and Regional Jet training students. The facility and dedicated ramp area will provide ample room for ATP's fleet of new Piper Seminoles and two CRJ-200 flight training devices, among all other items needed to provide top-notch training. The structure will be approximately 19,000 sq. feet including 10,000 feet of hangar and maintenance facility and almost 9,000 feet of flight school facility space. The flight school space will feature simulator bays, large classrooms, briefing areas, offices, and a break room. The new facility is situated on approx 2-1/2 acres of land with ramp access.View the construction photos. Phoenix-Mesa Gateway Airport is located 17 miles SE of Phoenix Sky Harbor Airport and is under a 5000' shelf of Class Bravo airspace. Jet and GA traffic may operate from all three parallel runways simultaneously. "The Phoenix-Mesa Gateway Airport airport offers a great location for flight training," says Jim Koziarski, ATP’s Vice President of Flight Operations. "As hiring has increased, more pilots are seeking their multi-engine ratings, CFI ratings and Airline Transport Pilot certificates to be competitive and Phoenix will offer all of these programs in addition to ATP’s renown Airline Career Pilot Program and Regional Jet Standards certification." This location offers flight training from Private Pilot thru Instrument Rating and Airline Career Pilot Program in a fleet of Piper Seminoles, Diamond DA40s, Cessna 172s and Frasca FTDs. In 1984 ATP pioneered cost-efficient, accelerated, multi-engine flight training with an emphasis on pilot career development. Today, ATP’s Airline Training Programs prepare graduates for airline pilot and corporate pilot careers with nationwide flight experience in the largest, multi-engine training fleet. Advanced jet training transitions these pilots from light twins to modern regional jets in CRJ-200 flight training devices. With thousands of graduates who have completed airline training on time and on budget, airlines come to ATP first to meet their demand for pilots. ATP flies over 7,500 hours to provide more than 300 FAA pilot certifications each month at 25 locations nationwide.